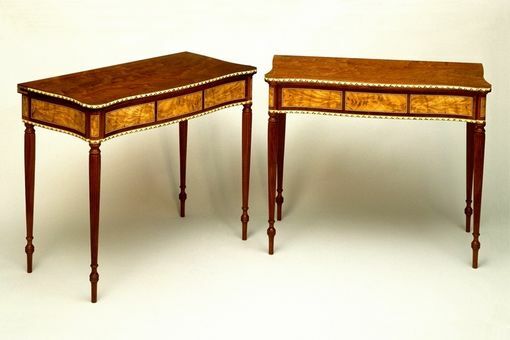 This is a matching pair of Boston Sheraton card tables based on a John and Thomas Seymour piece. They are serpentine sides with serpentine fronts and feature the lunette banding on both the upper and lower edges of the aprons. Both rear legs are fly legs to support the table top when open. The tops are matching beautiful pieces of mildly figured pudding mahogany. These tables could be used in a hall or entry way or living room. Traditionally, the pair of tables would flank either side of a room. These pieces are available for sale. Dimensions: Approximately 36" square when open by 28" high.